The Norwegian Public Roads Administration (NPRA) has begun a road improvement project for Regional Road 22 (rv.22), an important transportation route running through the municipality of Fet, approximately 30 kilometers east of Oslo. The road is being expanded to four lanes to relieve congestion, increase capacity, and improve emergency operations. 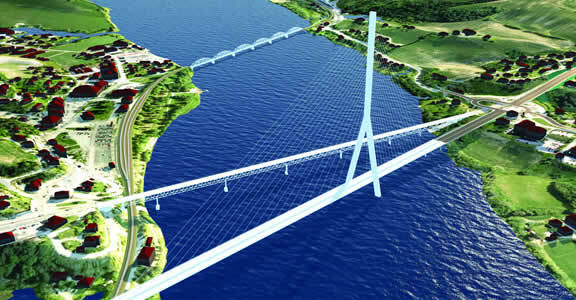 Additionally, a new bridge over the nearby Glomma River will improve waterborne traffic on the river. 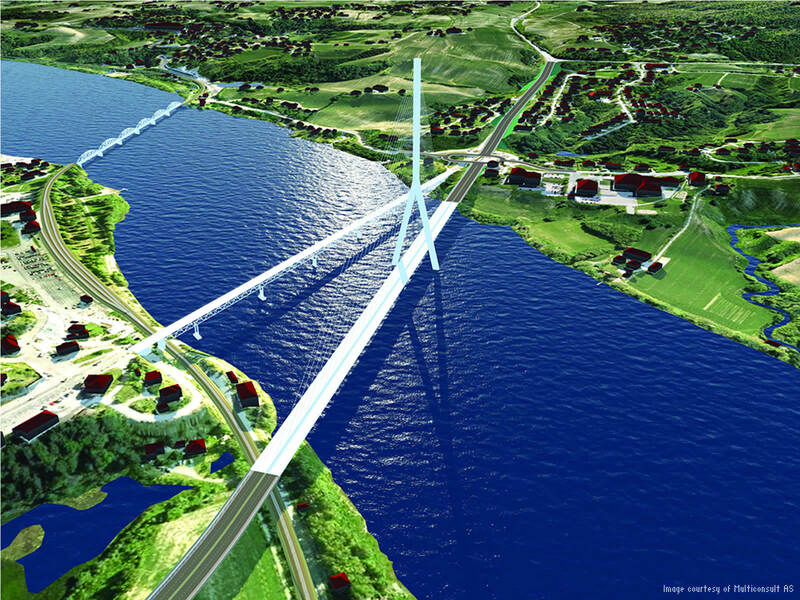 Multiconsult AS, one of the leading firms of consulting engineers and designers in Norway and Scandinavia, was tasked with the development of early stage designs and simulations for the project. 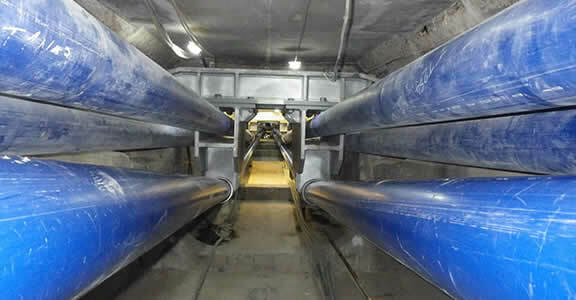 For almost 100 years, Multiconsult has played a key role in developing some of Norway’s most important projects. The firm has been using Autodesk Building Information Modeling (BIM) solutions such as Civil 3D and Revit software products for over a decade to help improve project design and documentation. In 2011, Multiconsult also implemented InfraWorks software to develop and visualize conceptual designs. 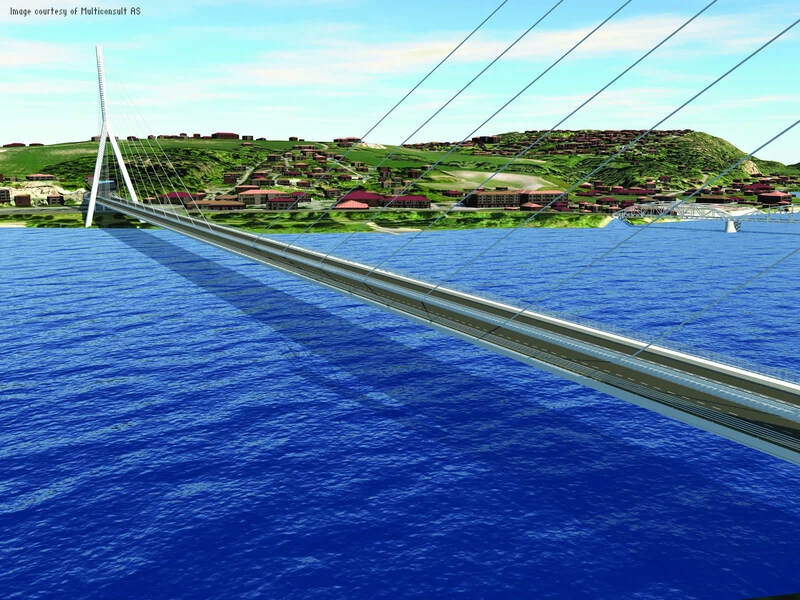 View of a Single Tower Cable-Stayed Bridge from 1 of 12 proposed road corridors. 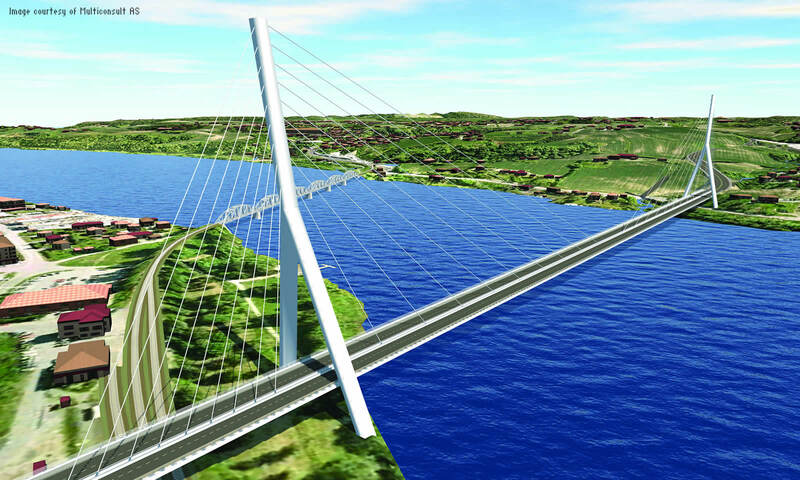 Multiconsult’s traditional method for creating project simulations of conceptual transportation or infrastructure projects was to use 3D modeling software products that are normally used for detailed design. 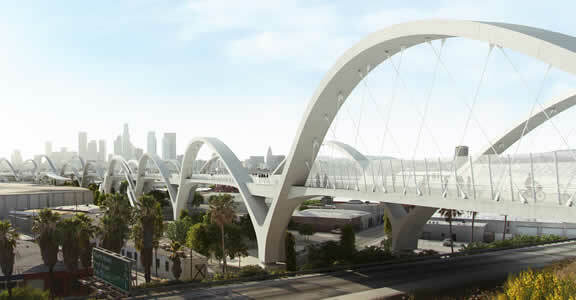 Individual components of the project—such as roads, bridges, and tunnels, as well as the existing environment—would be modeled using a range of software applications, and then these individual design elements were imported into a 3D architectural visualization tool used widely within Multiconsult. Another view of Cable-Stayed Bridge. 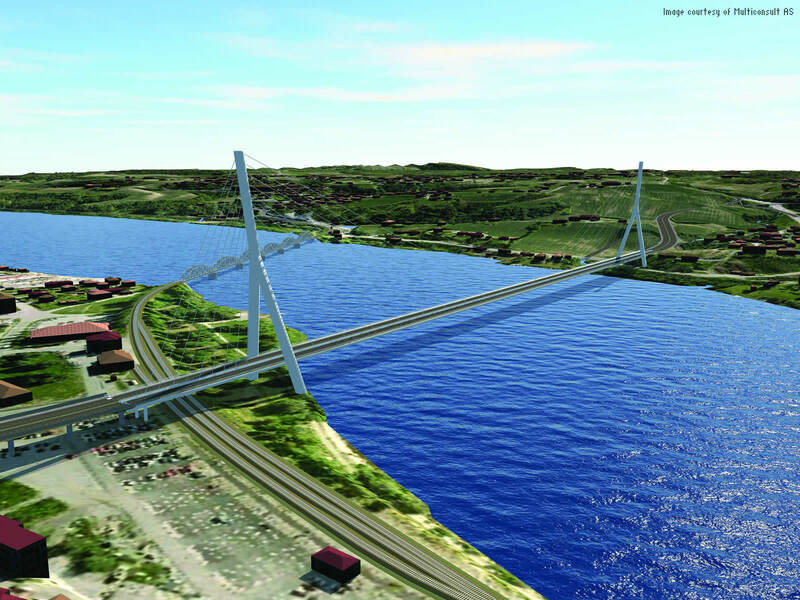 Once the base model of the existing environment was complete, Multiconsult imported some early stage design elements developed in other software applications, such as models for the new Glomma River bridge and 3D road alignments from a software application commonly used in Norway for road design. With the road alignments in place, the designers used drag and drop features of InfraWorks to assign road types (such as a divided highway versus a local road) to the imported road alignments. The team also used drag and drop styles for existing tunnels and bridges, saving days of work by not having to model tunnel portals and bridges. “With InfraWorks, there was no need to bog down the model with detailed road features such as shoulders or slopes to the existing terrain,” says Hon. “The model only contained stylized versions of road types, which are more than sufficient for a preliminary design.” The team also used InfraWorks to sketch new conceptual design elements directly within the software (such as adding landscape features) or edit existing features (‘demolishing’ buildings in the path of the new road for example). In addition, Multiconsult added hyperlinks to the InfraWorks model, associating road corridors in the model to profile drawings of the roads and terrain—enabling them to quickly open source data in their client meetings. Design changes were accomplished in two ways: by directly adjusting design elements within the InfraWorks model, or—when appropriate—updating the source data (such as the road alignments) and then simply refreshing that data source in InfraWorks to update the model. “By linking the data source to the model, any changes we made to the original data sources could be automatically reflected,” says Hon. 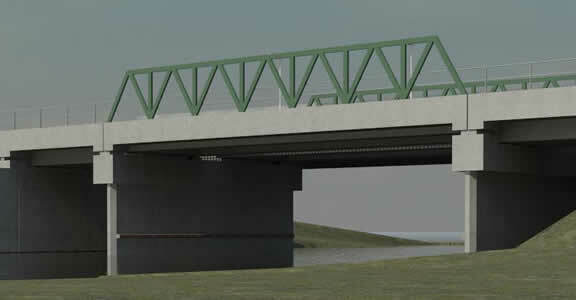 Close-up view of bridge design. 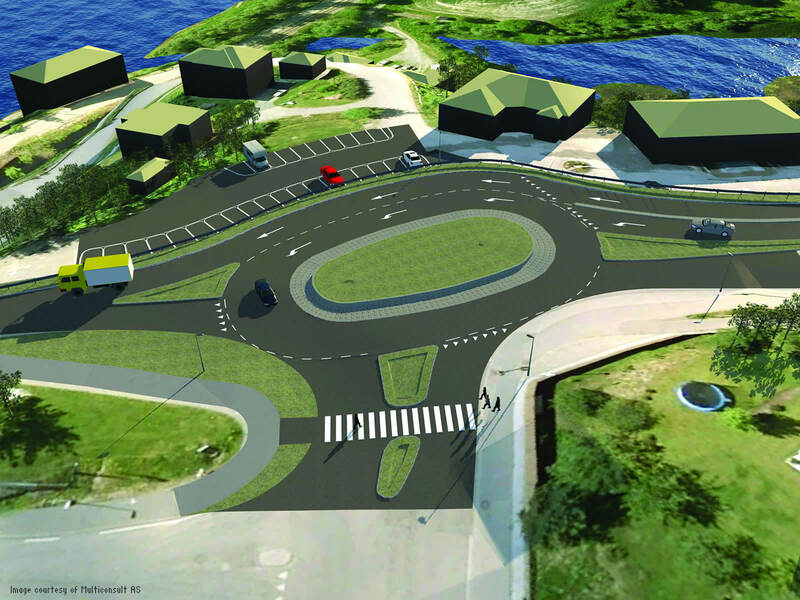 Multiconsult also used the InfraWorks model to produce high-resolution still images and animations that were presented during meetings with the client and project stakeholders. These project visualizations have since been used on NPRA’s website as well as the websites of affected municipalities and counties to help explain the design proposals to the public. Proposed upgrade of existing traffic light regulated intersection.